The path to Mong is an introduction of the second gameplay type in the game. 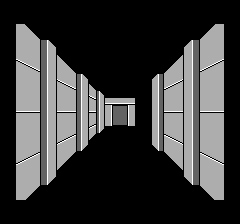 It is a short “3D” maze. There’s some nice details (doorknobs appear as you’re near a door) and it’s not annoying to map on your own. At this point in the game, the monsters are very dangerous. With savestates, I cleared the maze in about two tries, but it was very close. 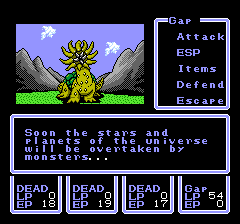 It doesn’t help that monsters seem to be in set locations, and they range from two monsters to six monsters. Exploring the maze on the path to Mong. There's no lights in the maze, so you have to use a litlamp to light it up. In Mong, the town’s crystal is missing. 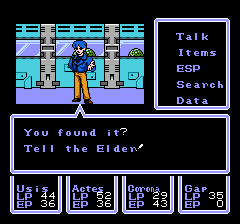 A guy has some buggy dialogue where he tells you to take the crystal to the elder, even though you don’t have it yet. Again, there’s some more grinding. There’s a fight to get the crystal back, and a lot of better equipment and spells to pick up. 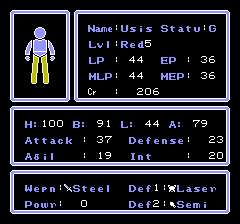 Still, you feel a lot more “powerful” by this point in the game. It could be that he's meant to ask if you have found it, but the text sounds more like it's coming at the wrong time. The towns still feel pretty different. I think that’s mostly due to a clever use of tiles and layouts. They’re not really inconvenient to explore, but they do feel different enough that you can tell where you are. Coming up next is opening up the next area (after some grinding,) and perhaps the first tower. It will likely take a while. This is the game over message. The game does play a little with text color in the dark mazes. The text there is dark blue.